Are you a lover of the arts? Perhaps you enjoy supporting the local art community in a fun and potentially competitive manner? Look no further: the Third Annual First Friday Art Auction is right around the corner and could prove to be the greatest to date. 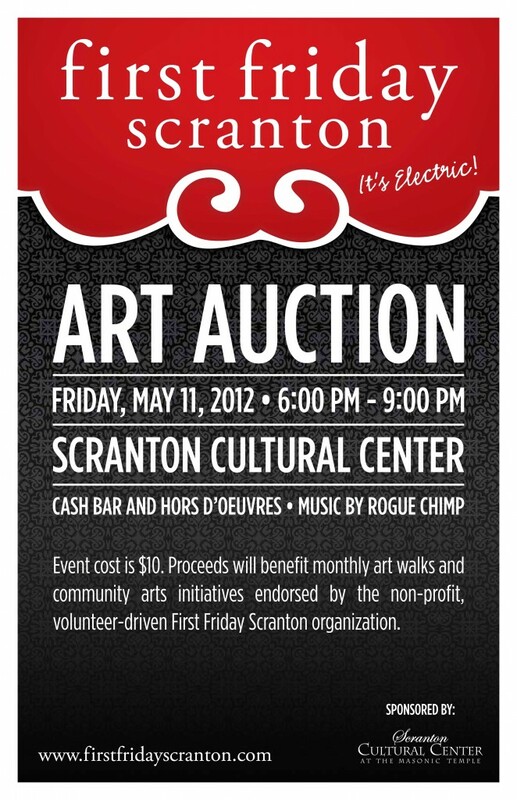 This year’s event will be held at the always impressive Scranton Cultural Center on Friday, May 11, 2012, from 6-9 p.m. Tickets are $10 at the door and includes a cash bar, hors d‘oeuvres, music by Rogue Chimp and a fun night of auctioning action! In addition, First Friday Scranton is also seeking contributing artists, working in all mediums, to donate their latest masterpiece. Accepted artists receive two complimentary tickets and a portion of the proceeds from their auctioned piece goes to support monthly art walks and creative initiatives coordinated by the volunteer driven First Friday Scranton organization. To pre-register your work go here.